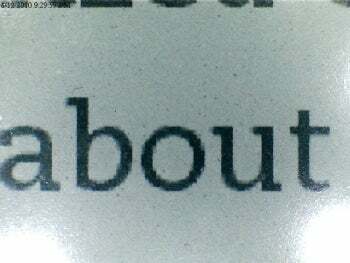 Magnified 400x: Is the Kindle Display Really Better Than the iPad’s? The display specifications of the Kindle and iPad have been measured up close and personal by using just a USB microscope, with differing results. A Bit-101 blogger used a Veho VMS004 DELUXE USB Powered Microscope to test the screens of both Amazon’s e-reader and Apple’s iPad--and the resulting images were interesting, if not a little colorful. Magnified at 26x and 375x-400x, the close-ups of the iPad display show the typical pixilation of many liquid crystal display (LCD) screens, whereas the Kindle remained crisp and still relatively in focus. The iPad has a color IPS LCD display, whereas all the Kindle models use 16-level gray E-Ink displays. The results are hardly surprising, as the two products house very different technologies for different purposes. Check out the comparisons at Bit-101 to see how the two screens compared for yourself. As the name suggests, E-Ink is an electronic paper display that has a paper-like contrast to its appearance, making it great for Kindle’s primary use, reading. However, the display is quite limited for anything beyond reading. Meanwhile, the iPad’s LCD uses hundreds of pixels per letter and is very versatile. LCD displays render text, pictures and HD quality video, all the while being cheaper to produce and able to serve a bigger market. The iPad’s screen also packs a particularly high pixel quality to avoid it being too harsh on the eye. Which do you find more comfortable for reading? Tell us in the comments below.